Online shopping is one of the great conveniences of our technological world, but can sometimes be the opposite for those who have to sort through these parcels. Large volumes of mail and package delivery presents multiple unique challenges, especially for applications such as apartment buildings or universities. Bulk mail sorting bins are an easy way to make your mail center manageable and prevent your staff from being buried in boxes. An increased volume of mail means you need more storage space for said mail. Real estate is at a premium, and it’s likely that you don’t have the time or budget to expand your mailroom with more space. With automatic tracking and alerts, users know exactly when their package is delivered−and they expect it to be ready when they pick it up. Managing and sorting deliveries is especially stressful during prime times when recipients come to pick them up after work and class. A lack of storage space amplifies these issues, as you can’t store packages in space that isn’t there. Quick turnarounds and increased mail volumes make it easy to lose track of deliveries, making your efficiency and organization suffer and creating more work for staff. Just one lost package can mean days of extra work on top of an unhappy recipient. Automated tracking and barcode scanning are common in mailrooms, but even this requires an organized and efficient system. An organized mailroom and quick sorting process is the fastest and easiest way to stay on top of deliveries. For a quick first sort, the bulk mail sorting bins and shelves make it easy to identify and sort deliveries into their correct placement. The sorters are available with flat or tilted angle shelves to provide easy access and an efficient use of space. 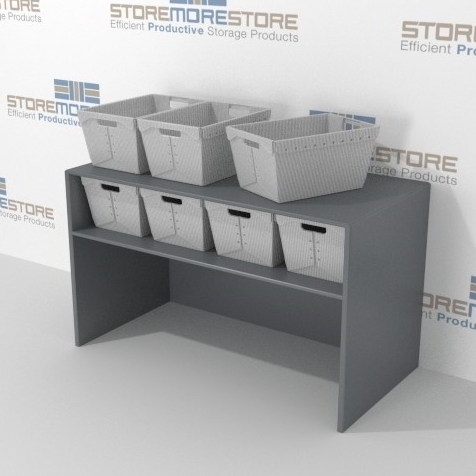 Bins are sized to fit on the shelves with no wasted space to make the most out of your storage. Shelving is available with up to 4 tiers of storage and a variety of finishes. Contact us for custom options! 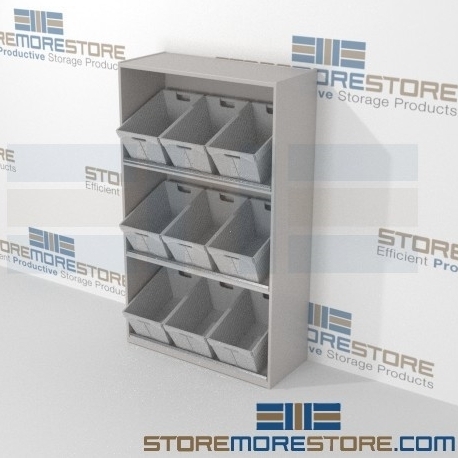 Bulk mail sorting bins with tilted angle and flat shelves are available to buy online. Bins and shelves are sold separately. For further assistance, give us a call at 1-855-786-7667. One of our storage experts will be able to help answer all of your questions.